I’ve fallen into a pattern in the past 5 years. You see, I’ve had 3 or 4 interns on my team and they’ve all been guys. Not on purpose, mind you. It just sort of turned out that way. I’ve taken to calling them “my boys.” The gender bit isn’t the pattern of which I speak, however. It is the habit I’ve developed of making hats for them. 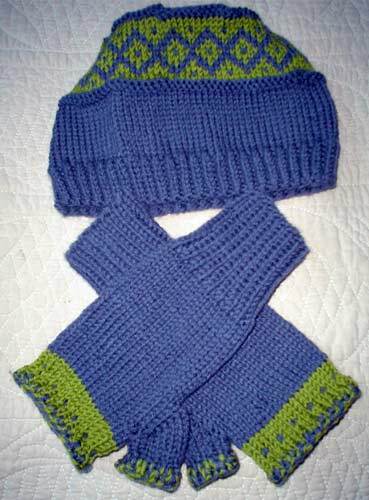 The latest items off the needles are for Chad, who asked for blue and green. I came up with a tiny bit of colorwork by cobbling together the diamond chart from one pattern with a star-shaped crown from another. Better get this boxed up and sent off. Looks like the temperature will be dropping back to what passes for normal in the Midwest. I think he’ll be able to use the hat and mitts right away. Mom saw the new bag today…she didn’t like me reminding her that it lives with me and the P-Man, sorry Mom! Your “boys” are so LUCKY. I love the hat, and the color on the fingerless mits is perfect. Oh, I had two intern boys this summer, but I never thought to knit them something! I guess because it was summer. The hat and mitts are great! I just love the colourwork on those pieces and the colours you’ve chosen. I think he’s going to love them. I can’t get over this heatwave you all are having on the mainland! That is really a lovely gift! Back in the day when I was an intern, I think I got a hug or some such when I had completed my time there, and last but not least I got a job too. However, I would have really felt much more welcomed with handknit items… Good job – you must be the ultimate team player!